Big and bright — GLAMSPIRATION. Do you wish a magic makeup fairy would tell you the secret to brighter eyes? To make your eyes appear brighter try applying white eyeliner along the top and bottom inner lids of your eyes. This will accentuate the colour of your eye and give your eye a rounder shape... Soon your eyes will be looking bigger and brighter than ever! Get lining and shining ladies. 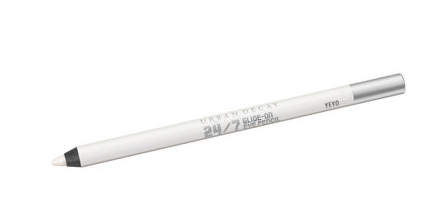 To achieve the look we recommend using Urban Decay's 24/7 Glide On-Eye Pencil (Yeyo shade).